Thengamara Mohila Sabuj Sangha TMSS New Job Circular-2019 has published their website www.tmss-bd.org. Thengamara Mohila Sabuj Sangha TMSS published the appointment notice on the bdpratidin newspaper on 13 April 2019. Under Thengamara Mohila Sabuj Sangha TMSS it will be appointed in its vacant position. Candidates who have qualified and experienced candidates will be permanently assigned to the posts. All information and notice of the application can be found on Thengamara Mohila Sabuj Sangha TMSS website www.tmss-bd.org. Candidates must send applications online only. Interested candidates will be recruited for a total of 03 posts in total 03 categories. Candidates who have passed HSC / Degree / Post-Graduate Degree can apply. The information provided according to the instructions of Thengamara Mohila Sabuj Sangha (TMSS) Representation Notification will be provided. The application signed by the candidate will be sent online through 22 April 2019. Incomplete / Incomplete application form or after the scheduled time no application will be accepted. All recruitments and Thengamara Mohila Sabuj Sangha TMSS policies will be followed during recruitment of interested candidates. The application signed by the candidate will be sent to online Managing Director, Thengamara Mohila Sabuj Sangha (TMSS) through 22 April 2019. If you want to apply the selected post through online you will need to visit the Thengamara Mohila Sabuj Sangha TMSS official website www.tmss-bd.org. Please join us for getting recruitment notice for more government or private jobs. Thanks for visiting our website www.ejobscircularbd.com. Visit our website www.ejobscircularbd.com or Facebook page, Twitter for regular appointments and results for each recruitment test. 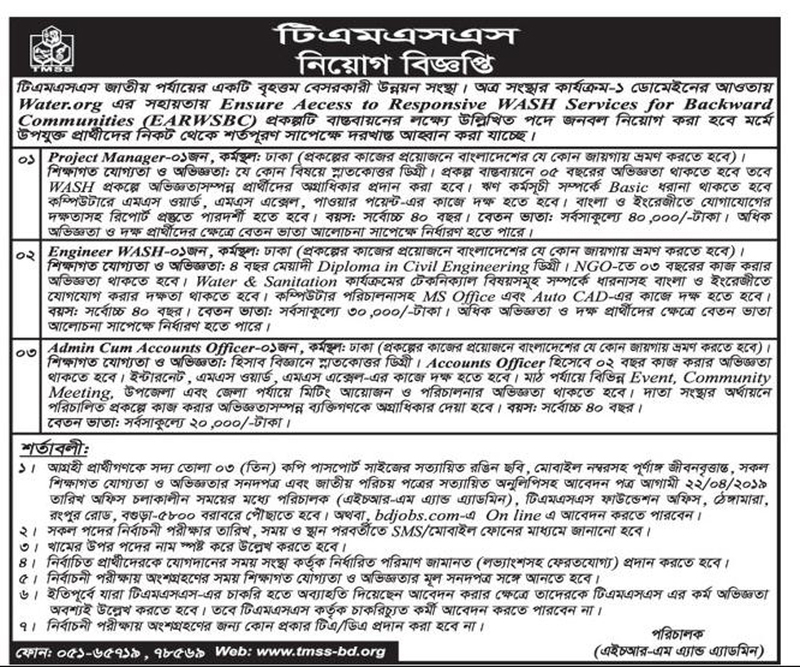 Post a daily update job circular on our website. We will be happy with your success and we always ensure the service. We will update later on the appointment notice of Thengamara Mohila Sabuj Sangha TMSS. Besides new job offers-2019 will be available on their website- www.tmss-bd.org.